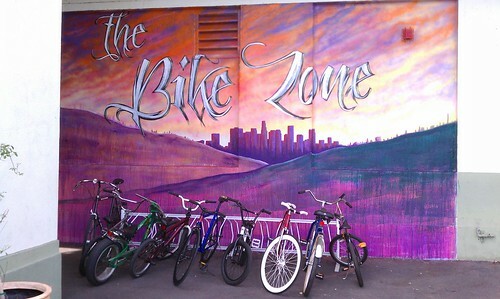 In a sign of the times, a new mural marking off the “The Bike Zone” greets students riding their bikes to Cypress Park’s Nightingale Middle School. The mural was created through the work of staff and students in a special program run out of the “D3 lab” on campus. Joe Linton, CicLAvia’s first paid employee and long time bike and river advocate, and Josef Bray-Ali, from the Flying Pigeon LA bike shop, stopped by at the end of a week of bike-themed events to give a brief talk about bike safety (“Control the lane!”), a clinic on patching a tube, and some general information about getting engaged in implementing the bike plan in their community. 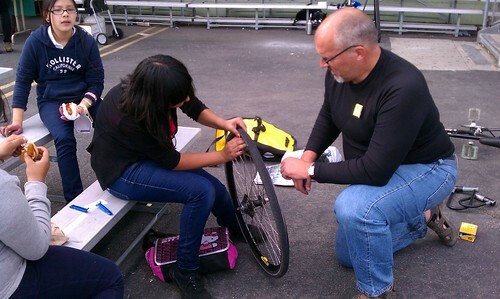 It was a fun way to spend the afternoon, and hopefully will help these young adults ride safer, better prepared, and informed. Though our little talk and demo only captured 20 or so kids’ attention, there were almost 100 milling around the bike racks to see and be seen. Our efforts at the shop have often focused on complaining to City Hall about things, and not enough hands-on work with members of our community. The Figueroa For All project, and the help of dedicated people like Joe Linton and Ms. Chou at Nightingale, have kept us out of city hall – and kept us working to better our local community before crying to the mayor or city council office for help.